The red-billed oxpecker (Buphagus erythrorhynchus) is a passerine bird in the starling and myna family, Sturnidae; some ornithologists regard the oxpeckers to be in a family by themselves, the Buphagidae. It is native to the savannah of sub-Saharan Africa, from the Central African Republic east to South Sudan and south to northern and eastern South Africa. Its range overlaps that of the less widespread yellow-billed oxpecker. The red-billed oxpecker is a native of the savanna of sub-Saharan Africa. It ranges across Ethiopia and Somalia through Kenya, Tanzania, Malawi, and Zambia to southern Africa, Botswana, Zimbabwe, southern Mozambique, and north-eastern South Africa. Juvenile oxpecker is darker brown than its parents. Its bill is dark olive at first, but gradually takes on adult coloration after four months. Its flight is strong and direct, and their call is a hissy crackling trik-quisss. The red-billed oxpecker nests in tree holes lined with hair plucked from livestock. It lays 2–5 eggs, with three being the average. Outside the breeding season it forms large, chattering flocks. 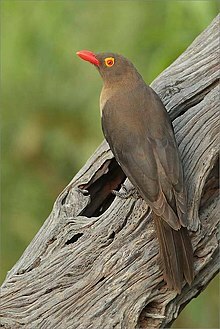 The preferred habitat is open country, and the red-billed oxpecker eats insects. Both the English and scientific names arise from this species' habit of perching on large wild and domesticated mammals such as cattle and eating ticks. An adult will take nearly 100 blood-engorged female Rhipicephalus (Boophilus) decoloratus ticks, or more than 12,000 larvae in a day. However, their preferred food is blood, and while they may take ticks bloated with blood, they also feed on it directly, pecking at the mammal's wounds to keep them open. ^ BirdLife International (2012). "Buphagus erythrorhynchus". IUCN Red List of Threatened Species. Version 2013.2. International Union for Conservation of Nature. Retrieved 26 November 2013. ^ "Buphagus erythrorhynchus (Red-billed oxpecker)". www.biodiversityexplorer.org. ^ "Red-billed Oxpeckers - Beauty of Birds". www.beautyofbirds.com. Zuccon, Dario; Cibois, Anne; Pasquet, Eric; Ericson, Per G.P. (2006). "Nuclear and mitochondrial sequence data reveal the major lineages of starlings, mynas and related taxa". Molecular Phylogenetics and Evolution. 41 (2): 333–344. doi:10.1016/j.ympev.2006.05.007. PMID 16806992. Wikimedia Commons has media related to Buphagus erythrorhynchus. Red-billed oxpecker – Species text in The Atlas of Southern African Birds.